IRONBRIDGE GORGE, Shropshire, England - It may be common to believe that Pittsburgh, with the steel mills that sprang up along the Monongahela and Allegheny rivers at the end of the 19th century, was the birthplace of the modern metals industry, but that distinction belongs to this placid, tree-draped, four-mile-long valley along the upper reaches of the Severn River, 100 miles upstream from Bristol. It was here three centuries ago that Abraham Darby, an enterprising, God-fearing Quaker, arrived to set up an operation for the casting iron cooking pots. In those days, most metal cookware was made from brass and was very costly. Young Darby had apprenticed at a foundry in Bristol and, with the help of another employee, had worked out and patented a method to cast pots out of iron, which was cheaper than brass. But Darby's inventiveness didn't end there. He also devised a way to smelt iron with coked coal, which was abundant in the hills of western England, rather than using charcoal, which required stripping the land of lumber. use coal Quality iron was still being "bloomed," that is smelted in small batches using charcoal as fuel to fire the transformation. That limited iron production to the availability of timber for charcoal, and demand for trees regularly outstripped local supplies, which meant iron furnaces had to be periodically moved to new territories. Coal on the other hand was abundant in the hills of western England and Wales, and coke, the carbon that remains after volatile tars and gases have been cooked away, also burned hot enough to melt iron ore into metal. Coke had long been used to smelt brass, but attempts use it for blooming iron had failed because sulphur and other impurities in the fuel made for poor quality metal. Darby believed the problem could be solved by modifying the proportions of the furnace. 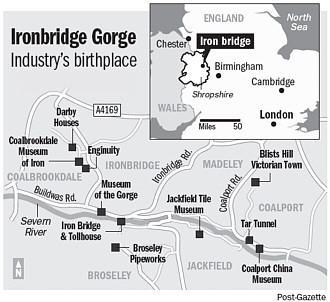 So he traveled upriver from Bristol and leased an old iron furnace in the settlement of Coalbrookdale along the gorge. He had the brick structure re-configured according to his specifications. On Jan 10, 1709, the first run of iron was drained from his refitted furnace. Initially, the quality of the metal was only fair, but the quantity and speed with which it had been smelted represented dramatic improvements. In addition the ability to use coke provided several significant competitive advantages. Not least was that furnaces could be built larger and for long term service, rather than having to move them periodically when local forests were cut down. Before long, Darby's new iron furnace was producing the previously unimaginable quantity of six tons of iron per week, and his company began mass casting a range of cooking pots at high quality and low cost. Business prospered, and by 1715, work was started on a second, larger furnace capable of turning out 12 tons a week. The industrial age was under way. Unfortunately, industrial pollution got to Darby, who died in 1717 at age 39, but family members continued the operation., even before the second furnace became operational. His son-in-law, Richard Ford, took control of the iron works until Darby's son, Abraham II, took over in 1745. He was succeeded by his son, Abraham III in 1772. Darby's iron works grew and pioneered innovative techniques for making and casting the versatile metal, and their ideas were quickly applied elsewhere. The resulting competition kept driving down prices. By the 1770s, the once pastoral river valley was well on its way to becoming an industrial dynamo, much of its machinery cast from Darby iron. There were more forges and furnaces along the two miles of the gorge than anywhere else in the world, and their fires burned long into the night. In a very real sense, the iron that flowed from this gorge made possible the rapid expansion of the British Empire. Smaller factories that made clay tiles and smoking pipes had taken root along one bank, while ceramic china was being manufactured on the other. The ravages of industrial pollution were becoming a problem, but equally troublesome were the floods that periodically roared through the narrow valley, inundating property, swamping ferry boats and destroying low stone bridges. In 1775 a local draftsman T. F. Pritchard approached Darby's son, Abraham III, with an audacious plan to erect a bridge of cast iron to span the capricious Severn. Pritchard's design called for a graceful, 60-foot-high arch of iron members to span 100 feet between two masonry abutments. No iron structure on that scale had ever been attempted. The project required 380 tons of iron, all of it smelted in nearby furnaces. Some 800 structural members, the largest of which weighed 4 tons and measured 70 feet, were cast in open sand forms constructed right on the building site. Construction took most of two years. No one really knew what would happen when everything was bolted together and raised into position, and the project's extra costs nearly bankrupted Darby, who had agreed to pay all overages. But the design was true and if anything the bridge was over-built. From the moment it opened on New Year's Day 1781, the iron toll bridge across the Severn became an immediate, international sensation, a tourist attraction drawing admiring visitors from across the country and around the world. Artists, writers, engineers, spies, royalty and peasants, all came to marvel at that "most incomparable piece of architecture." Though other, even more graceful iron bridges were constructed along the river over the Severn during the next decades, Darby's delight had captured an enduring place in history. And the bridge itself has endured for nearly 230 years. Vehicular traffic used it to cross the river until 1934, and tolls were still collected for pedestrians until 1950, when ownership was turned over to the county council, which developed the bridge and other facilities in the gorge as historical attractions. In 1986, the gorge was declared a World Heritage Site, a place of outstanding cultural or natural importance to the common heritage of humanity. In addition to the Iron Bridge and its adjacent toll house museum, the gorge features nine other engaging small museums packed with artifacts from the area's industrial age. Among these are the Coalbrookdale Museum of Iron, three floors of displays housed in the Darby's former iron works, encompassing a detailed history of the company and its products, including the brick works for the original blast furnace. Two hundred yards away are the two sturdy stone houses built by Abraham I and his successors, carefully restored and filled with generations of family history and Quaker memorabilia. Also housed in the former iron works is Enginuity, a modern, hands-on museum chronicling all the ways that good ideas are transformed into reality. Situated in an old brick warehouse down on the river's bank, the Museum of the Gorge serves to catalogue and explain the history and ecology of the Gorge, from pre-historic times to the present. The Coalport China museum preserves the buildings and wares of the several ceramic and bone china manufacturers that operated along the river between 1796 and 1926. On the opposite bank of the river is the Jackfield Tile Museum. By the time the Iron Bridge was erected, utilitarian tile had been made from local clays for more than a century. By 1800, decorative tiles were being cast, and business really took off in Victorian times., when tiles became in vogue for everything from lining subway stations to decorating pubs. The museum houses a stupendous collection. The Broseley Pipeworks document along with a healthy trade in clay pipes for smoking tobacco. On the valley's upper slopes, Blists Hill Victorian Town re-creates the coal mining village that took root along the Shropshire Canal above the gorge. In its collection of authentic shops, homes and a working forge costumed interpreters bring the past to life. All in all, Ironbridge Gorge makes for a fascinating foray into the early evolution of the industrial age, and a full day is not enough time to explore all of its various elements.